San Francisco's 42nd annual Pride Parade drew as many as a million people to Market Street and the Civic Center Sunday -- including two unusual groups: Mormon supporters of gay rights and Occupy-movement critics of the event's commercialization. 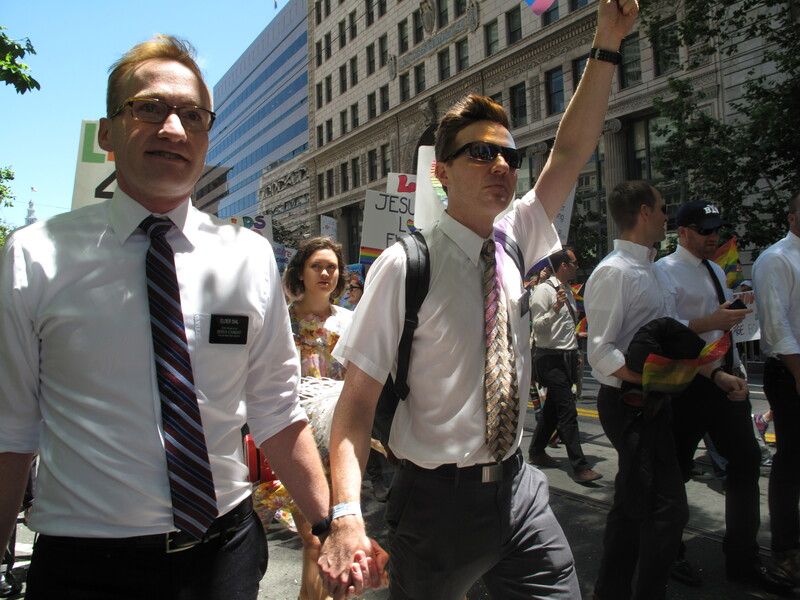 About 100 Mormons marched in contradiction to their church's opposition to the practice of homosexuality. Among the marchers was Carol Lynn Pearson who wrote a book about her marriage to a gay man. "It's high time that everybody, especially including my religion, the Church of Jesus Christ of Latter Day Saints, the Mormons, get on board the wagon of love without saying, 'Except you, except you,'" Pearson told reporter Kyung Jin Lee, on assignment for KQED. Mormons also marched in Pride celebrations in New York, Houston and Seattle. Bringing a very different message, about 100 Occupy protesters temporarily blocked the parade route, according to the SFist blog. The group chanted such gems as, "Out of the sidewalks into the streets," "Community, not commodity,' and "We're here, we're queer, we're not going shopping,"